One of the most important things to know when applying finishes is the distinction between the bases of different products. There are spirit-based finishes, those based on oils, and the newer acrylic or water-based ones. Put simply, the base of a product is the solvent or liquid the various 'finish' components are dissolved in or mixed with, and will be the same as that used for cleaning your brushes or other equipment. An example of a spirit-based finish would be French polish; an oil-based product could be a varnish; and a water-based finish might be an acrylic floor sealer. See the table to the right for the base compatibility of each product. Whenever a finish is applied over a similarly based previous coat, there is often the possibility that the second will partially dissolve the first. In some cases making sure that the first coat is fully dry will help avoid this, and in other cases a sealing coat between the two will prevent it from happening. Either way, some vigilance is called for and samples should be made up wherever possible to ascertain what will work or not. This is possibly the most familiar of all wood finishes, and undoubtedly the most misunderstood and abused. Varnish was initially developed by seafarers as a waterproofing agent for their boats, in a time when good use was made of everything that a tree could offer - not just the timber, but also the resin which seeped slowly from within. Varnishes are generally made up of four component parts: resin, oil, spirit and driers. The resin is the part of the varnish that forms the hard film, and the spirit, often turpentine, is what it's dissolved in. The oil - linseed or tung, for example - provides a bit of flexibility and elasticity to the varnish while the driers speed up the drying time, which is very important, especially in today's busy world. After application, the oil in the varnish slowly dries, absorbing oxygen and becoming a tough and slightly pliable solid, helped by the evaporation of the spirit content and a subtle polymerisation of the resin. While oil-based varnishes are still popular with restorers and musical instrument makers, most of us will be familiar with today's synthetic version: polyurethane. Although they are more hard-wearing, polyurethane varnishes can have a 'plastic' appearance, and are harder to repair when damaged than the oil-based equivalents. 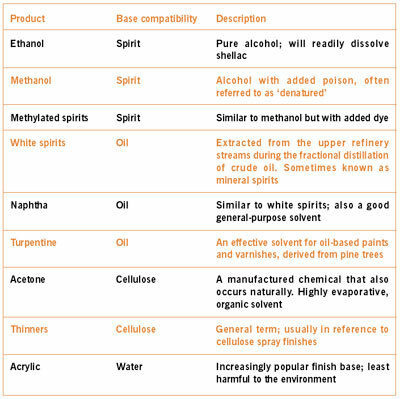 There are also spirit-based varnishes, which are similar to oil varnishes except that the resin is dissolved in alcohol - generally ethanol - and used in one or two specialist applications, notably for knotting prior to painting. Water-based varnishes are now available as a result of continuing demand for safer and more environmentally friendly products, and these are steadily improving in quality and durability all the time. This is the classic furniture finish, the one which gives many antiques their special and desirable appearance. It is achievable in varying degrees of quality by the amateur but, when mastered, it really is an impressive skill - something that soon becomes apparent when watching the professional at work and the results produced. French polish is made from shellac, a powdered insect-derived resin, which is dissolved in spirit or alcohol - however unlikely that sounds in today's hi-tech world. Developed in France in the 1820s, French polishing has been popular ever since, as its matchless high sheen is still sought after by many discerning customers today. Unlike most other finishes, French polish is applied with a cotton pad or polishing 'rubber', which is used to produce the beautiful high lustre most of us are familiar with. Unfortunately it's not the most hard-wearing or durable of finishes and is easily marked by solvents, alcohol or water - so perhaps it might not be the most suitable finish for your new bar-top. Wax is probably the oldest and most widely used of finishes, and for centuries has remained a popular and pleasing finish for all things made of wood. Despite offering little in the way of protection, a wax finish built up over the years is particularly appealing, something that the patient amongst us will appreciate more than others. Most commonly used as a sacrificial or maintenance finish over a shellac or a varnish, wax is great for giving an instant 'lift' to a tired finish, as well as imparting the local atmosphere with one of the nicest smells known to mankind. The majority of paste waxes are formulated from carnauba, beeswax and paraffin wax. The carnauba, a palm tree derivative, gives a wax its hardness and shine; beeswax is softer and has a more satiny appearance; and paraffin is added to make the wax more easy to apply. Coloured pigments and dyes are often added, and their use is to be encouraged, especially on darker woods, or else an inadvertent liming effect could occur. The most notable exception to the general make-up of a furniture wax is a proprietary brand known as Briwax. This has a different smell and constituency to most waxes, having a higher toluene content than other similar products. Unlike the majority of paste waxes, Briwax needs to be buffed up immediately after application and builds up a 'skin' in a very short time. It is most effective on pine and has long been a staple of the antique pine furniture trade. This is another misunderstood finish, mainly used in mass production and factory-assembled furniture. Developed as an alternative to shellac in the 1920s, its main constituent is cellulose nitrate (commonly known as nitrocellulose), and was produced from post-war gun cotton stockpiles in its early days. As time has gone by, additives and continued developments have improved the characteristics of this hard-wearing finish, and it is now widely used throughout the world, despite its sometimes slightly suspect 'ageing' characteristics. It can look shabby quite quickly if abused and neglected. For the amateur woodworker, cellulose lacquer won't be the first finish on the list. It is almost exclusively applied by spray gun, and is only really viable for batch production; both the cost of materials and the effort involved in setting up a spray booth make it rarely cost effective for smaller work. Oil finishes are increasingly popular these days, partly due to their subtle semi-matt appearance, and also because they must be one of the easiest finishes to apply without too much fear of ruining the job. They are especially convenient for smaller work, particularly carving or turnings. Derived from natural constituents, linseed, tung and Scandinavian are among some of the most commonly available oils. They are all examples of 'drying' oils, which means that they will harden and dry when exposed to oxygen, unlike, for instance, a mineral oil that you would use on your oilstone. This is obviously an important characteristic for woodworkers, as well as the oil's ability to add depth and enhance the figure of the timber. Many years ago the craftsman would produce a special, deep lustre oil finish with daily application of linseed oil rubbed in by hand, generally for weeks, sometimes even for months. Acrylics were originally developed as a safe and environmentally friendly alternative to cellulose finishes, but the early water-based lacquers and seals were not entirely successful, tending to mark quite easily and to react poorly to water and steam. Now, however, it's a different story and water-based finishes are right up there with their longer-established chemical counterparts. As it becomes more difficult to legally spray cellulose and solvent-based finishes in towns and built-up areas, professionals are increasingly looking towards less toxic options. Water-based finishes fill this need, as well as being considerably less harmful to the environment. They are also non-flammable, and very popular with the occasional or DIY finisher who likes the easy clean-up and lack of odour. Because water is not a solvent for most resins, other chemicals are added to create and maintain an emulsion of evenly dispersed resin in the mainly water liquid carrier. These other chemicals help give the acrylic finish its distinctive blue-white colour, something that can be an advantage when finishing white or light-coloured timbers where maintaining their natural colour is important. Water-based finishes take a bit of getting used to at first, especially if you're used to the golden hue that most other solvent-based finishes impart, but advantages such as short drying times, ease of application and a fume-free environment soon outweigh their shortcomings. These finishes represent quite a specialised field of their own; they are developed to provide the hardest-wearing finish of all, as well as enhancing the looks of the timber floor they're applied to. The strongest and most hard-wearing of floor seals have traditionally been oil-based. These tend to have a timber-enhancing golden hue to them, and usually require a minimum of 12 to 24 hours between coats. This is fine if the floor is in a corporate boardroom which is empty over the weekend, but close to impractical if it's your front room the day before a party. For a few years now, acrylic seals have been gaining popularity both in the trade and for the switched-on DIY finisher. Their hard-wearing characteristics are generally on par with the oil-based equivalents, although they won't add anything much in the way of colour, possessing the familiar milky tone common to most acrylic finishes. Wax can play a part in a floor finish, although mainly in a maintenance capacity, both on oil- and water-based seals. Oiled finishes by themselves are finding increased popularity; a simple matt to satin effect is generally the result, although regular applications are required to keep the floor protected and looking good. "Oil finishes are increasingly popular"
Reactive: these harden by reaction with air or other substances (such as a chemical catalyst). Once hardened, no reverse is possible. Varnish is a good example. Evaporative: These dry by evaporation with no polymerisation (molecular bonding) taking place. They can be re-dissolved by their solvent - such as shellac (French polish) and some lacquers - at any time.